There are some ingredients that seem to have been created specifically to be eaten in unison. 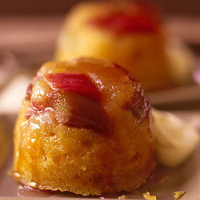 Ginger, rhubarb and oranges are a case in point, and perfect in these light steamed puddings. Butter four 150ml dariole moulds or ramekins. Cut the rhubarb into 3cm lengths. Spoon 1 tbsp stem ginger syrup into each mould; top with rhubarb. Put the butter, sugar, flour, baking powder, ground ginger and eggs into a food processor. Add the orange zest and juice and blend until the mixture becomes a thick batter. Finely chop the stem ginger and fold into the batter before dividing it between the moulds. Cut 4 pieces of foil, about 2cm larger than the top of the moulds. Make a pleat down the middle of each piece, then place them over the moulds and scrunch up the edges of the foil to seal. Bring the water in your steamer to the boil. Steam, covered, over a medium heat for 40 minutes. Remove from the heat and let the puddings stand for 2 minutes before turning out onto plates. Serve with vanilla custard or crème fraîche. A glass of something sweet but not overly sophisticated like Spanish Jerez is just right here, given the happy collision of ginger, rhubarb and orange in the puds.